New York Council, Navy League of the United States, Inc. - Outside-Events-of-Interest-to-our-Members New York Council, Navy League of the United States, Inc. Here's a sample of what some of our allied organizations are doing. There is no shortage of organizations in New York City dedicated to the maritime services. See below for a small taste of upcoming and ongoing events from a few of our favorites. For more information and to confirm dates and times, click on the links in each entry to visit their websites. | Email us at info@nynavyleague.org if your organization is interested in being listed here. 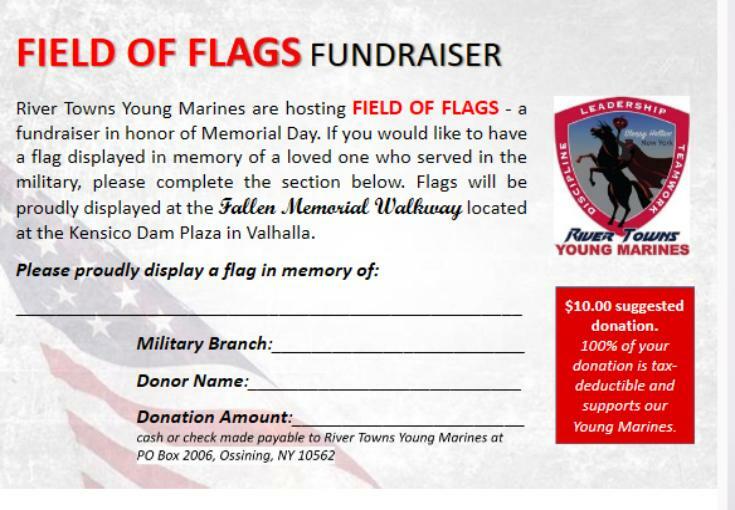 River Towns Young Marines are hosting Field of Flags, a fundraiser in honor of Memorial Day. In memory of a loved one who served, you can have a flag displayed at the Fallen Memorial Walkway, just complete this form! Best selling author Rick Campbell donates 3,000 books annually to Navy and Marine Corps veteran and youth organizations, including the New York Council and our sponsored youth units. His 5th novel, Treason hit the bookstore shelves with fantastics reviews. If you want to purchase this military thriller — or anything else — get it from Amazon with our Amazon Smile, Amazon will donate a portion of the sale to the New York Council! NYMAS, The New York Military Affairs Symposium, has posted the schedule for their Winter-Spring 2019 Friday talks. These talks are dedicated to increasing public knowledge and awareness of the interrelationship of war, society and culture. Beginning January 4th and ending June 14th, these talks are open and free to the public. They will be taking place Fridays from 7:00 P.M. to 8:45 P.M. at The Soldiers', Sailors', Marines', Coast Guard and Airmen's' Club. The National Alliance on Mental Health is an organization dedicated to helping those affected by mental illness build better lives. Their Homefront Education program, is a 6 session program [for friends, family, and significant others of Military service members and Veterans with mental health conditions] designed to help families understand and support their loved ones. This program is made to address the unique needs of family, caregivers and friends of those who have served or are currently serving our country. It is taught by trained family members of service members/veterans living with mental health conditions. You can email NAMI here for course registration. “Cookies & Conversation” is a Youth Volunteer Opportunity that encourages students to interact and interview veterans about their service. An intergenerational student and veteran program for Brooklyn VA Hospital – Tuesday April 23, 2019 from 10am to 12pm. Please note that space is limited, and this initial program is first come, first served. Students are encouraged to prepare questions to ask , and parents/chaperones are required. Fireboat John J. Harvey, launched in 1931, served the City of New York and New York Harbor until she retired in 1994. She was the largest, fastest fire fighting machine of her time, capable of pumping 18,000 gallons per minute. Saved from the scrap yard by a dedicated group of volunteers she is now moored at Pier 66 Maritime. The fireboat now serves as an operational museum and education center, offering free public trips to New Yorkers and visitors. This year the Fireboat John J. Harvey Chilly Party is going to be April 25th at 6:30 P.M.! There will be music by the Blue Vipers of Brooklyn, come to the museum early to explore one of the most interesting museums in New York! Get tickets here! The National Lighthouse Museum wants you to join them April 27th [3:00 P.M.-6:00 P.M.] for a film festival! The New York Preservation Archive Project is presenting the Staten Island premiere of the acclaimed short film, Managed Retreat (2018). Through this short Director Nathan Kensinger examines the fates of three New York City neighborhoods purchased by the New York State government in the aftermath of Hurricane Sandy. Tickets are $10 and include price of admission into the museum so you are free to explore! The U.S. WWI Centennial Commission would ask you save the date: Thursday, May 2nd, there will be a Wreath of Remembrance Ceremony. A pre- Fleet Week New York ceremony at Cypress Hills National Cemetery to mark the centennial of the U.S. Navy’s return home from WWI. The National Lighthouse Museum wants you to join them for their annual Jane’s Walk Weekend! Inspired by urban activist Jane Jacobs, these citizen-led walking tours are a global festival. Enjoy an enhanced exploration of Pier 1, the former U.S. Lighthouse Depot grounds, and more! Jane’s Walk begins the first weekend of May, so you can take part in this enriching experience Friday, May 5th at 1:00 P.M. and Saturday, May 6th at 3:00 P.M.
Monday, May 13th you can get yourself a New York Boating Certification & New Jersey Boating Certification! The National Lighthouse Museum, in collaboration with America’s Boating Club, is offering a one day certification course. The course starts and 8:00 am and ends at 5:00 pm. The cost for this one day course is $120 and includes breakfast, lunch, testing, certificate and the official guide book, America’s Boating Course by the United States Power Squadrons. Don’t miss this opportunity, register now! Mystic Seaport is the nation’s leading maritime museum. May 18th, Saturday, visit and discover American maritime history first hand! The tour lasts from 7:00 A.M. to 7:30 P.M. For $119 [adults] or $109 [kids 4-15yrs] you can climb aboard tall ships, watch a working preservation shipyard in action, stroll through a 19th-century coastal village, and so much more! Reserve your seat here! The Spring theme for The New-York Historical Society Classic Film Series is Justice in Film. Friday June 7th at 7:00 P.M they will be screening “MISTER ROBERTS” (1955) in the Society Auditorium (Manhattan) during New-York Historical’s Pay-as-you-wish Friday Nights. Opening remarks for this event is by Harold Holzer, of the Roosevelt House Public Policy Institute, and Craig Symonds, of the U.S. Naval War College. 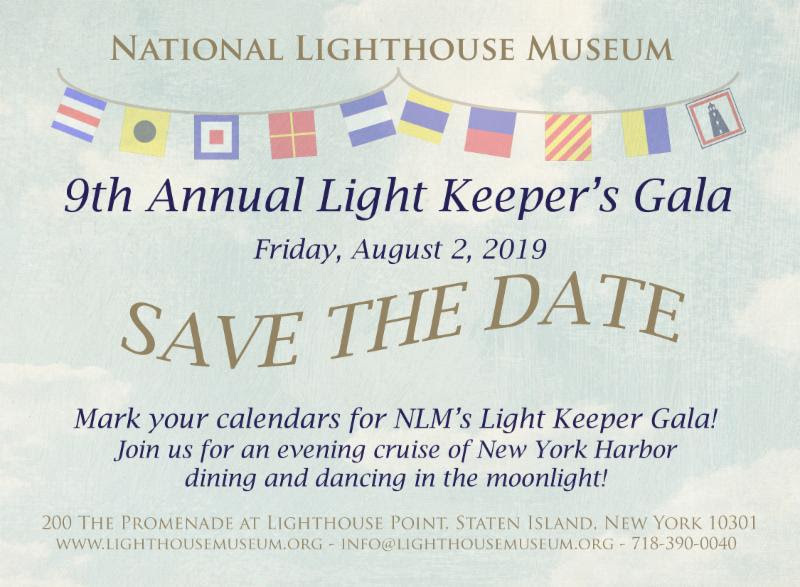 Its that time of year again, the National Lighthouse Museum’s annual Keepers Gala is Friday, August 2nd! Save the date to enjoy dinner and dancing by moonlight as you cruise around New York Harbor! The National Lighthouse Museum invites you to their 4th annual Lighthouse Point Fest! September 28th from 12:00 P.M. to 6:00 P.M. join them for live music, delicious food, face painting, and more! Make sure to bring your families, admission is free! Visit their site for more information. In efforts to aid the transition from active service to higher education, Columbia University is presenting free online courses for student veterans. The Brooklyn Veterans Treatment Court is seeking military veterans to serve as mentors to fellow veterans involved in the criminal justice system. Continue to serve and be a battle buddy for a veteran in need. For more information and/or to volunteer, please contact Veterans Peer Specialist Anthony Tamburello IV. Veterans of all United States Armed Forces can now shop online with CGX and AAFES, gaining access to exclusive military pricing on name-brand products, exclusive credit opportunities and more. The first step is to get verified at VetVerify.org, so start today and get ready to save. Andy Carroll and the Center for American War Letters at Chapman University are initiating a "Million Letters Campaign." The goal of their campaign is to collect and preserve war-related correspondence in an effort to honor the stories of veterans, troops, and loved ones. Carroll is travelling nationwide to speak about the importance these letters and meet with those who contribute to the campaign. Further information on the campaign and Carroll's contact information can be found on the CAWL website. Veterans and military families can enjoy free sports, concerts and other events through the nonprofit Veteran Tickets Foundation, a new partner of the Navy-Marine Corps Relief Society. Visit them online to create a free account, verify your military service, then request tickets from a selection of hundreds of events across the country. A small delivery fee will apply when you receive tickets. Carnegie Hall offers veterans a 30% box office discount on tickets to every one of their presentations throughout their season — close to 200 performances every year. The SUNY University Center for Academic and Workforce Development helps to promote educational and vocational opportunities for adults throughout New York State. The UCAWD provides academic services, job training and opportunities for employment through 12 SUNY Educational Opportunity Centers. The 30+ Advanced Technology Training and Information Networking labs provide access to current technology for economically challenged neighborhoods, allowing users to improve their academic and vocational skills. The New York Military Affairs Symposium provides audio podcasts of their past Friday Evening Talks. Recordings of the free and public talks can be accessed here. The Virtual Wall is a website that has a memorial page for the 58,300 men and women who are named on the Vietnam Veterans Memorial in Washington, D.C. Website visitors can add memorials or tributes to the pages. Follow this link to access the index of names by state. The Veterans Future Lab at NYU Tandon is accepting applications for Apex, a “one-year, no-cost incubator for veteran-owned early-stage companies.” Qualifying veterans may receive free housing at Fort Hamilton in Brooklyn, NY, which is a short train ride from the Veterans Future Lab. Program participants will also have access to free desk space, VFL prototyping space, NYU Tandon’s resources, a community of fellow entrepreneurial veterans, and many more benefits. Learn more about Apex and apply here.